November 11, 2015 – Since it began operations in December 2009, NASA’s NEOWISE mission has observed 158,000 asteroids and discovered more than 35,000. The NEOWISE mission hunts for near-Earth objects (NEOs) using the Wide-field Infrared Survey Explorer (WISE) spacecraft. Funded by NASA’s NEO Observations Program, the NEOWISE mission uses images taken by the spacecraft to look for asteroids and comets, providing a rich source of measurements of solar system objects at infrared wavelengths. These measurements include wavelengths that are difficult or impossible to detect directly from the ground. NEOWISE is one of 54 ongoing projects supported by the NEO Observations Program in fiscal year 2015. NASA-funded survey projects have found 98 percent of the known catalogue of more than 13,000 NEOs. NASA-funded surveys are currently finding NEOs at a rate of about 1,500 per year. The NEOWISE mission uses a repurposed NASA spacecraft to find and characterize asteroids. Launched in December 2009, WISE was tasked with documenting in infrared light some of the most remote objects in not only our galaxy, but our universe. Less than two years later, WISE had done just that, scanning the entire sky not once, but twice. From galaxies, to stars, to black holes, WISE collected data on over 750 million celestial targets of interest. With its mission a complete success after a year of operations, WISE was put into hibernation. In December 2014, the space telescope was revived with an updated mission and a new name. Its job was to find and collect the infrared signatures on some of our closest celestial neighbors – asteroids, comets and near-Earth objects. Now led by Principal Investigator Amy Mainzer of NASA’s Jet Propulsion Laboratory in Pasadena, California, the mission was named Near-Earth Object WISE, or NEOWISE. As an infrared telescope, NEOWISE sees the heat emitted from celestial bodies. Although it’s common to think of objects in space as very cold, our sun warms the surfaces of asteroids, making them glow brightly in NEOWISE images. Even asteroids as dark as black ink, which can be difficult to see against the darkness of space in visible wavelengths, can be spotted by NEOWISE’s camera. With these thermal models, the NEOWISE team has measured the size and brightness of about 20 percent of the known asteroid population. In the first year since reactivation, Nugent and the NEOWISE team have made these measurements for almost 8,000 asteroids, including 201 near-Earth asteroids. NEOWISE snaps an infrared image of the sky every 11 seconds from its orbit around Earth. Outside of Earth’s atmosphere, it always has a clear view of the night sky. NEOWISE’s orbit was designed so that the telescope never sees the sun because too much light would damage its sensitive sensors. Although NEOWISE has been a reliable workhorse operating long past its planned lifetime, its mission will eventually come to an end. The spacecraft’s orbit is changing, and sometime in 2017, engineers estimate it will move into too much sunlight to function. However, the team is eyeing a new space telescope, one with a little more muscle. 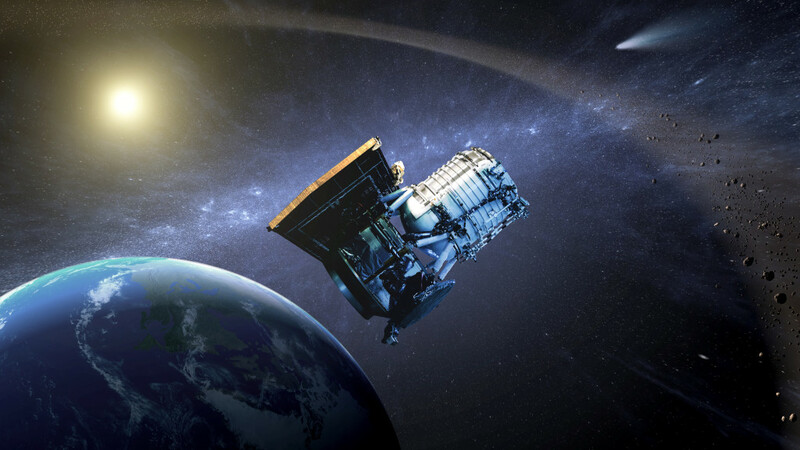 NEOWISE Principal Investigator Amy Mainzer led a proposal for a new asteroid-hunting spacecraft, the Near-Earth Object Camera (NEOCam). Unlike NEOWISE, NEOCam is specifically designed to hunt asteroids. NEOCam is one of five Discovery-class proposals funded for further study this year by NASA. Ball Aerospace & Technologies Corp. of Boulder, Colorado, built the WISE/NEOWISE spacecraft.